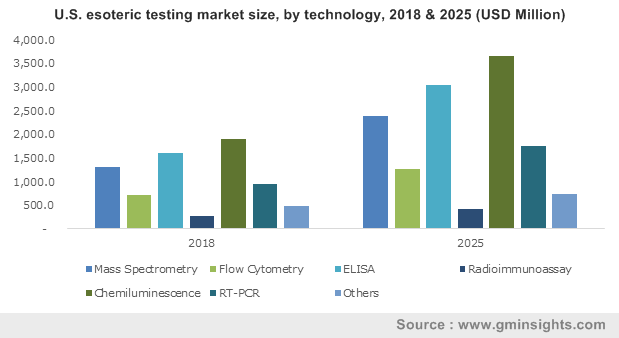 Esoteric Testing Market size was valued over USD 19 billion in 2017 and is expected to witness around 9.4% CAGR growth from 2018 to 2024. Increasing incidences of rare and complex diseases coupled with growing awareness about early disease diagnosis and treatment will drive esoteric testing market over the forecast period. According to European Commission, nearly 27 to 36 million people suffer from rare disease in European region. Rapidly improving healthcare sector in developing countries along with rising number of sophisticated laboratories offering advanced services will favour industry growth. Growing number of baby boomers prone to suffer from several chronic conditions will act as high impacting factor for industry growth. Rising prevalence of infectious diseases and chronic diseases such as cancer should escalate demand for esoteric tests over the coming years. Furthermore, technological advancements including antidote automation technology, standardization of advanced instrumentation and analytical systems will accelerate esoteric testing market growth over the forecast timeframe. Growing demand for proteomics and genomics coupled with increasing investment towards development of innovative test solutions for detecting rare substances in the body will propel business growth. The prediction and assessment of treatment response, growth of pharmaceutical industries and rising prevalence of chronic diseases has escalated demand for personalized genomics healthcare solutions. However, stringent regulations and dearth of skilled professionals in developing countries will restrain industry growth over the forecast timeframe. Infectious disease and immunology segment accounted for around 28% market share in 2017 owing to high prevalence of infectious diseases coupled with high demand for advanced molecular tests. Availability of immunology laboratory services for every medical specialty will positively impact segment growth in the foreseeable future. Globally, growing awareness regarding early disease diagnosis and treatment coupled with rising incidences of cancer will drive oncology segment growth over the forecast timeframe. Introduction of esoteric tests such as BRCAvantage developed by Quest Diagnostics for patients suffering from Hereditary Breast and Ovarian Cancer (HBOC) syndrome, who are at higher risk of suffering from cancer will positively impact business growth. Chemiluminescence business segment dominated esoteric testing industry in 2017 and is anticipated to witness over 10% CAGR growth owing to high adoption of chemiluminescence in esoteric testing due to its high efficiency along with necessity of small sample. Superior sensitivity and accuracy delivered by this technology using low analyte concentration will further stimulate business growth. ELISA business segment held over 20% of business share in 2017 and will witness more than 9.5% growth from 2018 to 2024. Moreover, ELISA is common technique for basic research, high throughput screening performed in laboratories, and drug discovery program. New developments in biomarker field leading to availability of new targets will generate revenue growth for the segment. U.S. esoteric testing market accounted for around 35% of the global industry share in 2017. Increasing prevalence of rare and complex diseases along with advancements in medical research will drive U.S. esoteric testing market over the coming years. Government initiated programs such as Obama Precision Medicine Initiative should positively impact industry growth. Cutting-edge genetic research conducted in field of cancer and rare diseases along with favourable initiatives such as UK Strategy for Rare Diseases established in 2013 will drive UK esoteric testing market. Leading researchers of National Health Service undertake ground breaking research into rare diseases to offer best possible care to patients suffering from rare diseases will drive country’s esoteric testing market. 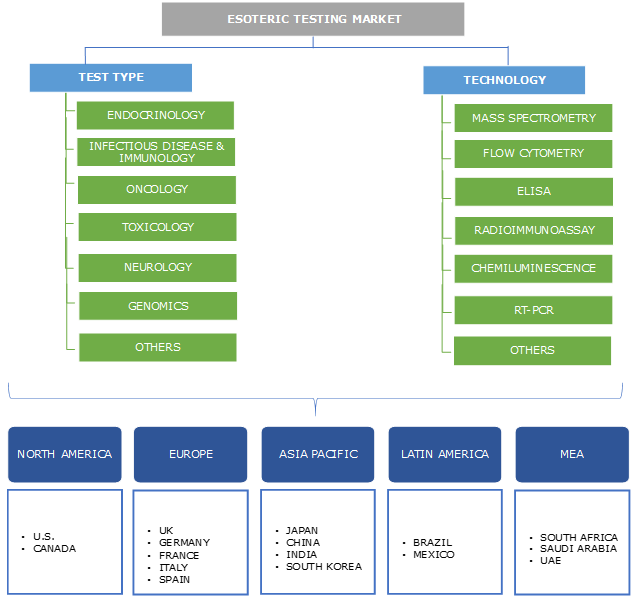 China esoteric testing market was valued at USD 1.2 billion in 2017 and is expected to witness over 12.5% CAGR from 2018 to 2024. Developments in healthcare infrastructure coupled with rising incidences of rare diseases will augment industry growth. According to WHO, nearly 10 million people in the country suffer from rare disease. Furthermore, developments such as artificial intelligence platform capable of diagnosing congenital cataracts will favour industry growth. Few notable industry players are Laboratory Corporation of America, ACM Global Laboratories, Quest Diagnostics, Arup Laboratories, Fulgent Genetics, Invitae, Mayo Medical Laboratories, Myriad Genetics, OPKO Health, Nordic Laboratories, Miraca Holdings, Genomic Health, BioMONTR and American Esoteric Laboratories (AEL). Industry players are adopting various inorganic strategies such as acquisition, strategic partnership and collaboration to enhance their product offerings thereby elevating its market position and business portfolio. Major players such as Laboratory Corporation of America and Quest Diagnostics dominate esoteric testing market. Acquisition is major strategy adopted by these industry players. For instance, LabCorp acquisition of Chiltern International in August 2017 to expand oncology segment. Increasing prevalence of infectious diseases and chronic diseases such as cancer along with rising awareness about early disease diagnosis has augmented demand for esoteric test. Other players such as Opko is also adopting similar strategy to broaden its product portfolio. Opko acquired Bio-reference Laboratory, in August 2015 to advance company’s clinical laboratory testing solutions. Esoteric tests are regulated under U.S. FDA regulation of laboratory developed tests and clinical laboratories and Clinical Laboratory Improvement Amendments (CLIA). Stringent regulatory framework lead to rise in economic burden over the laboratories along with delaying introduction of new tests in the market will hamper the industry growth over the coming years.